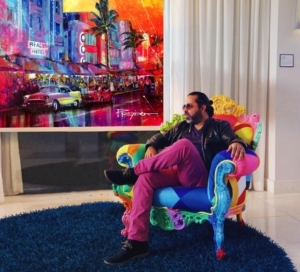 Business for the Arts Broward (BFA) presents its Arts Mean Business Speaker Series featuring advertising executive turned artist Hector Prado on Thursday, October 4 from 5:30 to 7 p.m. at Pipeline Lauderdale, 100 SE 3rd Ave, 10th Floor in Fort Lauderdale. The event is free and open to the public. Please RSVP by October 1 by calling 954-940-5344 or email rvegas@bfabroward.org. Parking is available in the building for a nominal charge. Complimentary cocktails and hors d’oeuvres will be served at 5:30 p.m. followed by the presentation at 6 p.m.
Born in Colombia, Prado is internationally exhibited and recognized by collectors and corporate brands around the world. His work has garnered critical acclaim from the Cannes Film Festival, London International Awards, Clio Awards, New York Festivals, Emmy Awards and more. Prado’s artwork has been utilized by Volkswagen, Hewlett-Packard, Steven Spielberg and many more. This Arts Mean Business event is hosted by Lauderdale Pipeline and presented by Broward Workshop, Broward County’s Cultural Division, the Greater Fort Lauderdale Alliance and BBX Capital Foundation.